Dredging proposals threaten our future: Community gathering and march. Where: Esplanade Lagoon, Western Events Area, Cairns, Queensland. What: Live Music, Speakers, March through town. Dress in blue, bring signs and banners, family friendly, fun, all welcome. 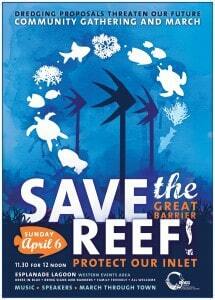 Speakers will include veteran environmentalist Bob Irwin. Stay up to date and show your support by joining the Facebook event page. 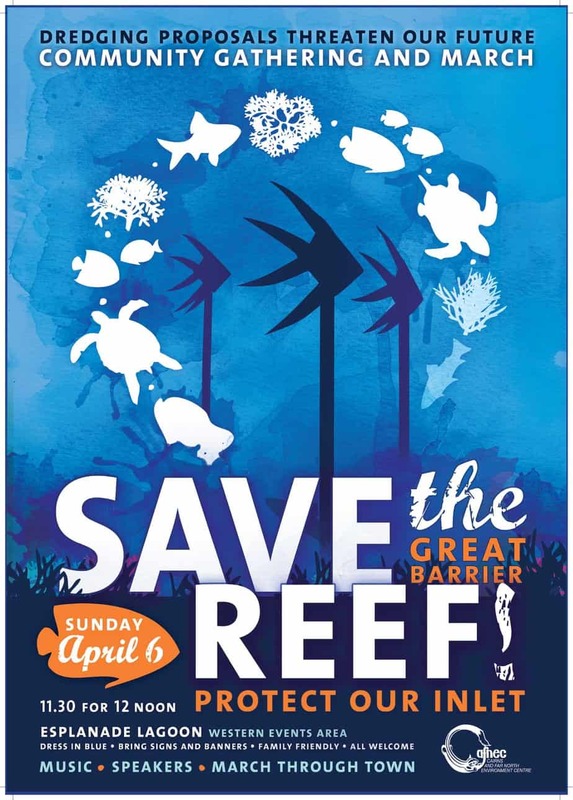 This will be a peaceful assembly of community concerned about proposals to dredge Queensland ports adjoining the Great Barrier Reef, including plans to expand Cairns Port (Trinity Inlet). There will be information on what has happened in the past at Gladstone Port, what is happening at Abbot Point and what is proposed for Cairns, Townsville and other Ports. PLEASE SHARE AND INVITE ALL YOUR FRIENDS, FAMILY, NEIGHBOURS, WORKMATES, EVERYBODY! Thank you to: The CAFNEC Marine Response Team who have done the organising and hard yards, Cairns Regional Council for help with venue hire, Cairns Police for their help and cooperation, Caroline Emms who has provided our budget, Sarah Goldfinch for graphic design, Gavin Singleton of the Dawul Wuru Indigenous Corporation for our welcome to Country, our speakers Bob Irwin, June Norman and Paris, our bands – Velvet Serviettes, Timber and Wood and The Walker Brothers and most of all to the Cairns and Far North Community who care so much about our natural environment. Direct impacts on marine life such as fish, dugongs and turtles. The impact of environmental damage from dredging on the tourism industry, recreational fishing and commercial fishing including the release of potentially contaminated sediment into the greater Trinity environment and it’s impact on both human and wildlife health. Impacts on critical habitat including seagrass beds and coral reef. The cumulative impact of this proposal in the context of the broader Great Barrier Reef environment, other dredging activities, shipping activity, and the massive increase in maintenance dredging that would be required. The environmental and amenity damage of increased (possibly toxic) mud washing up on our Northern beaches and elsewhere. ains heavy metals and other contaminants from industrial land uses and shipping. Options for dredge spoil disposal include dumping in the Great Barrier Reef Marine Park or onshore dumping options, both of which pose risks to marine life by increasing sediment and nutrient loads and introducing contaminants. Onshore dumping poses risks to terrestrial habitats as well as marine environments. The proposal also would require a doubling of the annual maintenance dredging program, with the ongoing impacts this would entail. The costs of this proposal would be significant with cost estimates of up to or over $120 million of taxpayer money. We don’t need new capital dredging in Trinity inlet, it will cost the environment and the tax payer, will hurt small business and fishers that rely on coastal and reef health, and could put the broader reputation of the GBR at risk by contributing to it being listed as by UNESCO as ‘world heritage in danger’… the list goes on. The economic benefit is questionable and can be achieved by bringing passengers ashore at Yorkeys Knob where a major upgrade is planned for this purpose. A recent survey of 843 cairns and Far North residents demonstrated a high level of concern regarding the Trinity Inlet dredging proposal. When survey participants were asked how concerned they were about the proposal over 95% of respondents indicated they were concerned and 75% stated they were ‘very concerned’. Less than 5% said they were not concerned or ‘don’t know’. The many approved or proposed dredging operations along the Queensland coast have contributed to major concerns for our international icon the Great Barrier Reef. It is time to say ‘enough is enough’ – we do not want damaging new dredging in Cairns Port.